Dr. Barrett Boody, M.D. is a fellowship trained, board eligible orthopedic spine surgeon. He attended medical school at the University of Chicago Pritzker School of Medicine. He completed an orthopaedic surgical residency at Northwestern Memorial Hospital in Chicago, IL followed by a spine surgery fellowship at the Rothman Institute at Thomas Jefferson University Hospital in Philadelphia, PA. He is available to see patients at the Fishers and Greenfield office locations. 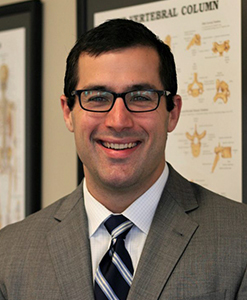 Dr. Boody has a special interest in primary and revision surgery of the cervical, thoracic and lumbar spine, sports injuries, neck and back pain and scoliosis. In addition to his clinical practice, Dr. Boody stays actively involved with research and medical education. He has authored numerous peer reviewed publications, served as a textbook section editor, and presented research at national symposiums. Currently, Dr. Boody is a co-investigator for multiple FDA trials conducted at the Indiana Spine Group. He also is a member of the editorial board for the Clinical Spine Surgery journal and is a manuscript reviewer for multiple peer-reviewed spine journals. Boody B, Lucasti CJ, Schroeder GD, Heller JE, Vaccaro AR. Extradural Arachnoid Cyst Excision. Clinical spine surgery. 2018. Boody BS, Schroeder GD, Segar AH, Kepler CK. Should Asymptomatic Patients With Cervical Spinal Cord Compression and Spinal Cord Signal Change Undergo Surgical Intervention? Clinical spine surgery. 2018. Larson JE, Meyer MA, Boody B, Sarwark JF. Evaluation of angle trunk rotation measurements to improve quality and safety in the management of adolescent idiopathic scoliosis. Journal of orthopaedics. 2018;15(2):563-565. Rosenthal BD, Boody BS, Jenkins TJ, Hsu WK, Patel AA, Savage JW. Thoracolumbar Burst Fractures. Clinical spine surgery. 2018;31(4):143-151. Patel AA, Dodwad SM, Boody BS, et al. Validation of Patient Reported Outcomes Measurement Information System (PROMIS) Computer Adaptive Tests (CATs) in the Surgical Treatment of Lumbar Spinal Stenosis. Spine. 2018. Boody BS, Bhatt S, Mazmudar AS, Hsu WK, Rothrock NE, Patel AA. Validation of Patient-Reported Outcomes Measurement Information System (PROMIS) computerized adaptive tests in cervical spine surgery. Journal of neurosurgery. Spine. 2018:1-12. Boody BS, Rosenthal BD, Jenkins TJ, Patel AA, Savage JW, Hsu WK. The Effectiveness of Bioskills Training for Simulated Open Lumbar Laminectomy. Global spine journal. 2017;7(8):794-800. Schroeder GD, Boody BS, Kepler CK, et al. Comparing Health Related Quality of Life Outcomes in Patients Undergoing Either Primary or Revision Anterior Cervical Discectomy and Fusion. Spine. 2017. Rosenthal BD, Boody BS, Hsu WK. Return to Play for Athletes. Neurosurgery clinics of North America. 2017;28(1):163-171. Boody BS, Savage JW. Evaluation and Treatment of Lumbar Facet Cysts. The Journal of the American Academy of Orthopaedic Surgeons. 2016;24(12):829-842. Boody B, Johnson P, Pugely A, et al. Validation of a Web-Based Curriculum for Resident Education in Orthopedic Surgery. Journal of surgical education. 2016;73(6):1060-1065. Boody BS, Savage JW, Eck JC, Hodges SD. Steroid Use in Adult Patients With Incomplete Spinal Cord Injuries. Clinical spine surgery. 2016;29(3):92-94. Jenkins TJ, Boody BS, Patel AA, Hsu WK. Intraoperative Neuromonitoring in Spinal Surgery. Orthopaedic Knowledge Online Journal. February 2016, Vol. 14, No. 2. Boody BS, Jenkins TJ, Maslak J, Hsu WK, Patel AA. Vertebral Osteomyelitis and Spinal Epidural Abscess: An Evidence-based Review. Journal of spinal disorders & techniques. 2015;28(6):E316-327. Boody BS, Jenkins TJ, Hashmi SZ, Hsu WK, Patel AA, Savage JW. Surgical Site Infections in Spinal Surgery. Journal of spinal disorders & techniques. 2015;28(10):352-362. Boody BS, Omar IM, Hill JA. Displaced Medial and Lateral Bucket Handle Meniscal Tears With Intact ACL and PCL. Orthopedics. 2015;38(8):e738-741. Rosenthal BD, Boody BS, Hsu WK, Patel AA. 7th ed. Elsevier. Management of Cervical Myelopathy: Surgical Treatment. Rothman-Simone: The Spine. Editors: Garfin SR, Eismont FJ, Bell GR, Fischgrund G, Bono C.
Boody BS, Chun D, Hsu WK. 2nd ed. Lippincott Williams and Wilkins, c2017. Orthopaedic Surgery Essentials: Spine. Chapter 36: Basic Science of Spinal Fusion. Editors: Bono CM, Schoenfeld AJ. P. 352-360. Boody BS, Rosenthal BD, Dodwad SN, Patel AA. 1st ed. AAOS, c2017. Spine Injuries in Athletes. Chapter 1: The Epidemiology of Spine Injuries in Athletes. Sporer SM, Rosenthal BD, Boody BS. Advanced Reconstruction: Hip. 2nd ed. Chapter 48: Noncemented Acetabular Revision. Editors: Lieberman, J.R. and Berry, D.J. c2017. Boody B, Haak M, Savage JW. 1st ed. ISCoS Textbook of Comprehensive Management of Spinal Cord Injuries. Lippincott Williams Wilkins, c2015. Chapter 12: Management of Subaxial Cervical Spine Fractures. P. 205-217.